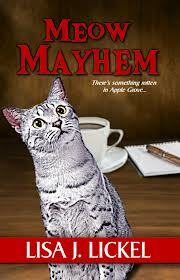 I just finished Lisa Lickel’s cozy mystery/romance Meow Mayhem, this morning and still basking in the glow of the sweetness of it. The small town of Apple Grove is dying and it’s mayor, Donald Conklin recruits fellow Egyptian Mau owners, Amanda McTeague Preston and Truesdale Thomson to move their businesses to the town, with incentives, to help stimulate growth. 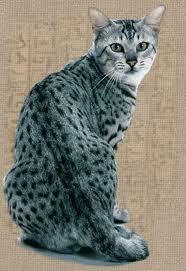 Egyptian Mau’s are a specific breed of cat, with spots instead of stripes. Valuable and pedigreed. True liked the idea of moving because he wanted to get to know Amanda. Amanda moved so she could start life afresh after being jilted by her fiancé. But life, and romance, never runs smooth. When the mayor is found dead, and possibly murdered the town spreads rumors and fights against the new businesses. Amanda and True wonder if this is where they are meant to be, but they believed the mayor’s vision for the town and want to honor him. So they stay and try to uncover the mystery. This book is unusual as it is written entirely in the first person from only Amanda’s point of view. I’ll admit that this is not my favorite type of POV to read and because of that, not the story, it took awhile for me to really get immersed in the mystery. Partly because Amanda keeps sticking her nose impulsively into trouble and I got frustrated with that! The mystery is well crafted though and with all the clues and problems that occur in the town there was no certainty of how things would resolve – or if they even would. Would Donald’s murderer be uncovered? What’s up with the chocolate (I even suspected that they might be poisoned and part of an evil plot to undo Amanda)? And those cats. I’m not a cat person and even went to look online to get a better feel for what this breed looked like. I loved the way Lisa Lickel gave each of the three cats in the story distinct personalities and how she beautifully highlighted the unique relationship a pet owner has with the pet they have come to love like family. I’m allergic to cats and didn’t sneeze once during this book. It was an enjoyable read and “cozy,” although towards the end I did start dreaming and wondering what was next when I would go to bed! Always the sign of a good book when it keeps you thinking about it even when you are sleeping. Thanks Lisa for this light, cozy mystery and for not making it too easy to solve. You tied it up nicely and even had room for a little bit of surprise at the end. Well done!